Since the marine industry downturn began two years ago, Brunswick Corp. has been staying a step ahead of the recession by drastically cutting costs and shoring up liquidity. These efforts have enabled the industry&apos;s largest boatbuilder to avoid even the threat of bankruptcy and earned it high praise from dealers and analysts alike. Tim Conder, managing director of leisure equity research for Wells Fargo Securities, has similar praise. "We continue to applaud management for the initiatives in cost, manufacturing footprint, and solid execution in a very challenging environment," he says in a recent report. During the last two years, Brunswick has closed 14 of its North American boat plants, cutting its manufacturing footprint here in half, to reduce excess capacity. The company has eliminated 9,345 marine jobs worldwide from 2007 through the end of July 2009. "We cut over $420 million of fixed costs over the last two years," says Dustan McCoy, Brunswick chairman and CEO. "That&apos;s a huge number," says Hayley Wolff, a senior equity analyst at Rochdale Securities. "They were very aggressive in taking production down and clearing out the channel to help the industry get its footing." McCoy says the company had to be aggressive "because the downturn was dramatic and fast." 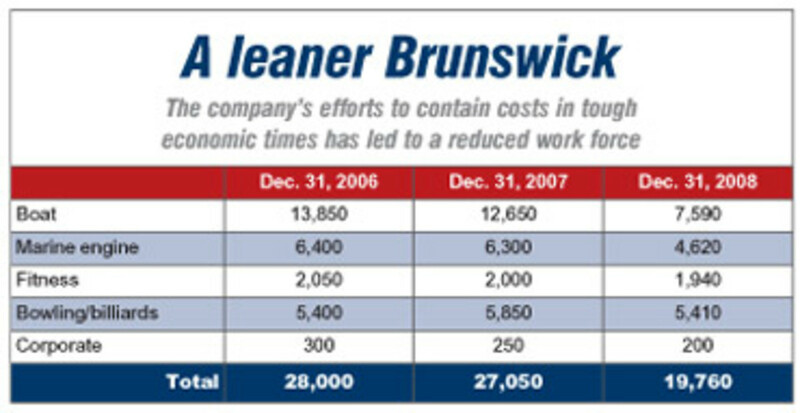 In fact, he says, the recession helped Brunswick accelerate a strategy it had begun before 2007 - to reduce the company&apos;s brick-and-mortar manufacturing infrastructure to improve efficiency, quality and productivity. "It&apos;s been a hell of a ride," McCoy said during a recent conference call hosted by Rochdale Securities. However, he says, "It&apos;s been the best thing to happen to this company. A lot of things we talked about doing finally are getting done." While efficiency, quality and productivity remain a central part of Brunswick&apos;s strategy, McCoy says the recession also forced the company to improve its cost structure so it could be more profitable and more competitive in a smaller industry. This involved shoring up liquidity to help offset the more than 50 percent drop in marine revenue since 2007, as well as charges associated with the restructuring. Brunswick has increased its cash position from $317 million at the end of 2008 to $359 million at the end of the 2009 first quarter, and to $461 million at the end of the 2009 second quarter. McCoy says it was the various cost-reduction activities throughout Brunswick, as well as solid cash management and inventory reductions, that allowed the company to conserve and generate most of this cash. Some of the money came from asset sales. For example, in August Brunswick sold its Integrated Dealer Systems software division to Constellation Software Inc. The boatbuilder also unloaded some of its physical assets, such as surplus equipment from the Knoxville, Tenn., plant that was sold this summer at auction. "Our actions in 2009 to maintain our liquidity position us well for 2010," McCoy says. At the same time, Brunswick recently issued new debt through a private offering announced in August. "We believe investors should view this announcement positively, as it removes 2010 refinancing risk and further enhances [Brunswick&apos;s] near/intermediate-term liquidity position," says Wells Fargo analyst Conder. The company raised $350 million due in 2016 - up from the $250 million originally expected. The money will initially be used to retire $150 million in debt due by the end of 2010. The remainder of the funds will be used to retire some of the $250 million that comes due in 2013 and, for corporate purposes, potentially its pension liability. "The upshot is we will have no substantial debt coming due before 2016," says McCoy in an interview with Soundings Trade Only. "We created a very long runway in which we can operate without the requirement to pay down long-term debt. That makes us much more competitive in times like these." Despite all of its efforts to shore up its balance sheets, Brunswick&apos;s stock price took a hit when the markets fell. In January 2005 it was selling at an all-time high of $50 a share. It declined gradually during the next two years, then faster in mid-2007, ending that year in the upper teens. In the fall of 2008 the stock plummeted along with the rest of the market, to less than $2 per share. A year later, it&apos;s back in the $9 to $10 range. Despite investor queasiness during that period, McCoy says Brunswick was never in danger of going bankrupt like some other marine companies. "It never crossed our minds that we weren&apos;t going to survive," says McCoy. Phil Keeter, president of the Marine Retailers Association of America, agrees. "I think Dusty McCoy and his team have a wonderful strategy," he says. "I think they are doing great things to stay alive. There was never a concern of bankruptcy." Dealers don&apos;t seem too concerned, either. "I think they are in pretty good shape," says Jim Browning, president of Browning&apos;s Marine in Virginia Beach, Va.
Browning and Keeter say Brunswick has a number of advantages over other boatbuilders: it builds its own engines, has a broad range of marine brands at various quality and price points and, with its non-marine businesses, has more diversity to better insulate it from the ups and downs of one particular market. They also give Brunswick high marks for supporting its dealer network through this difficult time. "They&apos;ve done a wonderful job trying to help their dealers," Keeter says. "They have not been aggressive in forcing dealers to take inventory." Brunswick is producing and selling product at wholesale at volumes well below retail sales levels, McCoy explains. "That caused a dramatic loss in revenue for us, but it helped dealers clear inventory," he says. "That&apos;s why we had to generate working capital to hold on to cash." He says Brunswick is also supporting dealers&apos; sales efforts with aggressive promotions and taking other steps to accelerate retail activity. For example, he says the Payment Protection Plan - in which Brunswick will make boat payments for certain brands if the customer loses his or her job within a year of buying the boat - has done well. "I think it was an added selling tool," says McCoy. Another major promotion highlights the benefits of Mercury&apos;s Axius sterndrive propulsion system and Cummins MerCruiser Diesel&apos;s Zeus pod-drive system, both of which have joystick controls. In June, the company launched JoystickBoatControl.com, a consumer Web site that provides information on these "revolutionary technologies," and updated viewers on a nationwide demonstration tour in the summer. The goal was to show people how easy and enjoyable boating becomes when the intimidation of docking and close- quarters maneuvering is removed. McCoy says removing that fear factor is certain to help bolster boat sales. "The pick-up rate is very high where we have Zeus and Axius," he says. 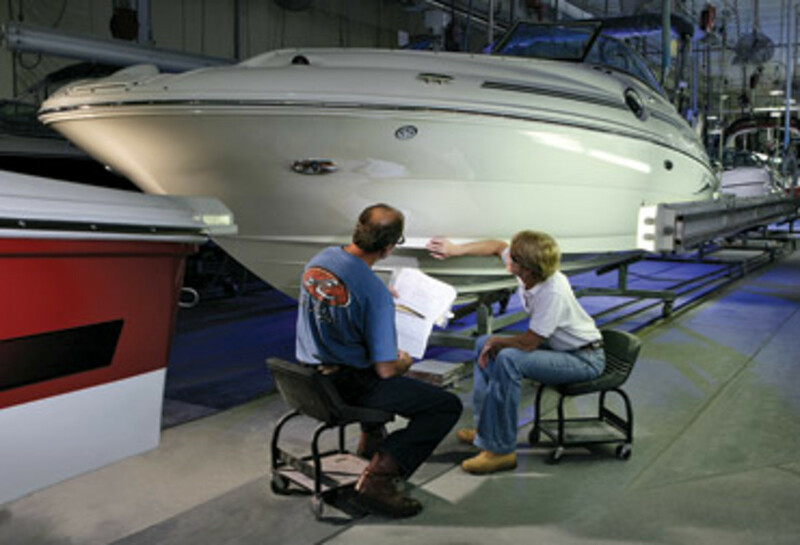 The boatbuilder is also helping dealers improve their bottom lines by providing savings on goods and services through the Brunswick Dealer Advantage program. Launched in 2007, the program allows qualifying dealers to benefit from discounted group rates on a variety of services, from health insurance to office supplies to Web site design. "I think that program has been good for us," says Watkins. His Sail & Ski was able to save money through BoatTrader, Channel Blade and lower insurance costs, he says. "We are doing everything we can to make our dealers succeed," McCoy says. "It&apos;s us putting our actions where our mouth is. "Our relationship with our dealers continues to get better," McCoy notes. "We&apos;ll come out of this with a better dealer network and a better company." Rochdale analyst Wolff says these efforts will help Brunswick in the long term. "In these difficult times they&apos;ve been able to give their dealers support," she says. "I think that&apos;s definitely helping their dealers through a difficult time and that will make more dealers want to gravitate to their brands." McCoy says the tough times are not over for either his company or the industry as a whole. "I think we&apos;re getting ready to head into a crucial time in the industry," he says. Fall marks the end of the selling season for Northern dealers. If sales remain stagnant and the credit market doesn&apos;t loosen up, he expects to see more dealership failures through the fall and winter. Still, he remains upbeat about the long-term future for the marine industry in general and Brunswick in particular. He says there is nothing structurally wrong that would keep the industry from going back to the 300,000 retail units sold in 2005, compared to a projected 135,000 for 2009. That&apos;s why he doesn&apos;t anticipate additional layoffs at Brunswick. "If we thought the industry would stay at 135,000 for an extended period, it would be necessary to reduce costs further," he says. "My judgment is that won&apos;t occur." However, he says, the recovery will be slow. "And for a significant period of time [annual retail unit sales] will be much smaller than 300,000." Even when the industry does rebound, it will never be quite the same. Instead, McCoy predicts, it will be better. "The industry will be much healthier than in the past," he says. A new business model is emerging, McCoy explains. Instead of building large numbers of boats on speculation, the new mantra will center on build-to-order, just-in-time manufacturing and staged delivery. This will require a new dialogue with consumers, beginning at the dealer level, especially those selling smaller boats. With larger boats that have a longer build time, buyers are more willing to order and wait. With midline boats, the key is to be nimble on the manufacturing floor so boatbuilders can make changes on the fly to fit customer demand. With smaller boats, however, McCoy says dealers need to have inventory in their showrooms to accommodate impulse buys. Therefore, manufacturers and dealers are going to have to be good about thinking where the demand is in a particular market. "There&apos;s going to have to be a bit of repositioning," he says. McCoy also wants to provide a system allowing dealers to move product between themselves to satisfy demand for a particular brand or model in a specific region. He is confident Brunswick is up to the task. "We believe Brunswick will emerge from the downturn leaner and with more market share," he says. "We will gain market share with great product, great service and great CSI, rather than just flooding the market." Others share his confidence. "I think they&apos;re going to come out as a much smaller company, but still a dominant force," says the MRAA&apos;s Keeter. Wolff, the Rochdale analyst, also expects Brunswick to emerge from the downturn with more market share. Furthermore, she says the production cuts and plant closures of the last two years leave the company better able to respond to demand in the market, rather than just building to produce inventory. "That will help them in terms of inventory management and making business less capital-intensive," she says. "The company is more disciplined, more focused on free cash flow and returning free cash flow to shareholders, instead of acquisitions," she adds. Says Conder, the Wells Fargo analyst: "Brunswick&apos;s actions should position the company to be the low-cost producer with a strong brand portfolio that will drive material share gains within the context of a much smaller U.S. market."